Is It Possible Trump and Some of His Associates Are Guilty of Treason? The United States of America was born in warfare, separating itself from the strongest military power on earth after eight years of fighting. From the beginning it pledged itself to peace but too often found itself in wars and armed conflicts, sometimes of its choosing and sometimes not. The United States has gone to war, declared or undeclared, twice with the United Kingdom, Germany and Iraq, and once with Japan, Italy, Spain, Mexico, Afghanistan, North Korea, North Vietnam and once within the country in the Civil War. . These wars, while bloody and costly, were never fought by enemies that had a realistic chance of destroying America. There is one country the United States has faced for decades but never directly fought in a formal war. Russia, in its former state of the Soviet Union or its present form of neo-imperialist state under the de facto dictatorship of Putin, was our opponent in the long struggle of the Cold War and remains our fiercest and most dangerous adversary. What makes Russia different from any foe the United States has ever faced in its history is that Russia alone of all of them could actually destroy America. China and North Korea could inflict damage as the forces of Islamic terrorism already have, but only Russia has the power to destroy us in a conflict. This reality truly puts the Trump Russian scandal in perspective. This is more than another shady real estate scheme to build another vulgar hotel or apartment building, the architectural equivalents of a black velvet painting. The numerous and expanding pieces of evidence of the Trump camp to pander to Russia and Putin and subvert our laws constitute a real threat to the security of the United States. So far Michael Flynn, Jeff Sessions, Paul Manafort and Jared Kushner have lied or concealed their contacts with Russian interests. Several have received substantial cash payments from Russia. The Republican Party platform was altered by Trump to remove the condemnation of Russian aggression against the Ukraine. 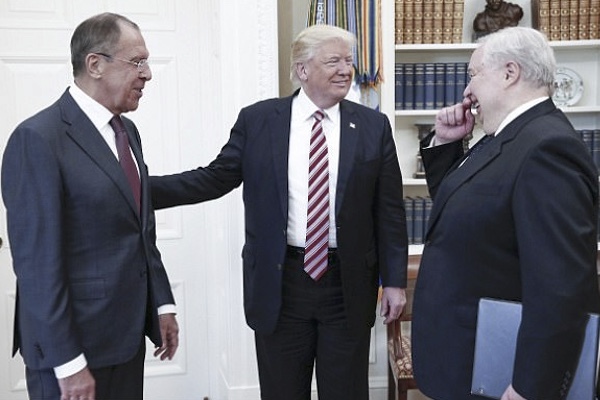 Trump brought the Russian foreign minister and the ambassador/spymaster into the Oval Office and revealed the most secret intelligence to them as the Russian news agency Tass photographed the smile fest while American media were barred from the meeting. In his recent trip to NATO headquarters Trump trashed our allies to their faces, the grabbing and pushing aside the prime minister of Montenegro more than symbolic. And when confronted with the softest of all softball questions ever asked of any president, Trump declined to criticize Putin instead declaring we are no better than the Russians. Little wonder that German Chancellor Merkel declared that Europe could no longer rely on the United States. The weakening of NATO, the alliance that is most responsible for deterring war, is a victory for Russia and a massive return on its investment hacking and manipulating the election in Trump’s favor. The capper, at least so far in this mile a minute story, is the blatant attempt to cover up the scandal in thinly disguised coercion of the FBI and the intelligence agencies. This has gone beyond bad policy or bad judgment. This is conduct bordering on treason, defined in the Constitution in Article III section 3 as “adhering to their enemies, giving them aid and comfort.” Treason is not a charge to be made lightly but the growing body of evidence makes its case day by day. This is no longer politics. This is not a game. This is a real and substantial threat to the nation. The Trump presidency must be stopped immediately before it is too late.